The Continental Grand Prix 4000 S road tyre has been developed and refined over the years, and is known around the world as one of the best race tyres on the market. Race proven, and road race tyre of choice for professional road cycling teams BMC Racing Team, Orica Green Edge, Lampre Merida and Lotto Belisol. Continental have taken their legendary GP4000s road tyre and given it a facelift. Now offering a subtle coloured sidewall to match to the colour scheme of your bike. They have also added a new size to the range, GP4000s II is now available in 28mm. This provides better grip in greasy weather conditions, increased puncture protection and better all round comfort. The new tyre also features the latest version of the Continental's BlackChili compound. Which now offers even lower rolling resistance, greater milage and increased grip in wet weather conditions. The backbone of the Grand Prix 4000 s road tyres remain unchanged. The 4000 S II still has the same Vectran Breaker for great puncture protection, BlackChili compound for unsurpassed grip performance and low rolling resistance, and not forgetting hand built in Germany. The global leader in the premium race bike tyre market. Strong in every department - a real all round race bike tyre. Advanced Black Chili compound for an even faster, safer ride. Vectran Breaker technology for increased puncture resistance. New colour and size options. Transforms the handling of any race machine. Love these tires. Before you switch to the new 5000, read the reviews. The 4000 has slightly higher rolling resistance but also better puncture resistance. Given the state of California's roads, I'll take the 4000. Merlin's price was terrific. Transatlantic shipping was fast and flawless. My first impression of these are that they roll very smoothly and I feel less road vibration. They seem like a well-constructed, good quality tire that's great for training and/or racing. I used to always use Vittoria (Rubino Pro, Open Corsa CX) but these tires are definitely tempting me to switch over. Used Conti Grand Prix for years and always renew with the latest version available, great rolling resistance and puncture protection. Service and price from Merlin is consistently good. Good all round tyre. Have had a few flats on these but no more than other brands plus they offer decent grip and weight. Very good handling, durability and weight for my type of riding- club, centuries, non racing. Used other brands over the past 20 years but this tire is the best for wear, rolling resistance and resistance to flats. So far so good. Put these on 2 days before my first half ironman and felt smoother than I`d been all training season. Riding 700 x 25C, 100psi (front) + 110psi (rear), weight is 120 lbs. Great tire for training rides. Easy to install & excellent puncture resistance. Wear indicators are still present after 7000kms! This one is a must for every road cyclist. Easy to fit, when on road, you feel less vibration. Easy on cornering. I haven't try on wet surface yet. My previous tire is Conti Ultrasport II. Conti 4000s have been my preferred tire for years. These tires have excellent rolling resistance and offer superior puncture resistance. They are expensive but when they are on sale -- which they often are -- they're an excellent choice. Still my favorite road tire, rolls fast but is grippy in high speed cornering. This must be one of the most popular road tyres out there and with good reason. The GP4000 is my standard for my summer bike and has served me well over many miles of leisure riding (over typically rough and pot-holed North-East roads). These are my go to tyres of choice for reliability and speed. You won`t regret buying these, I have had 3 pairs now and all lasted well with good puncture resistance. Fantastic road tire. I didn`t think a higher end tire would make a difference. Well, was wrong. These tires are a necessary upgrade if you are using inexpensive, entry level tires. I actually feel like I`m faster while putting in the same effort! They were a little difficult to get onto the rim though. Besides that, best tire I`ve ever used! I'm riding these great tires since many years. They are light, rugged, durable, and provide a smooth ride. Looks good and the reports are good. I had 6 punctures in 4 days with schwalbes........I am looking for the reputation of Continentals to continue. One of the best allround tyres, be it racing or in training. Great rolling resistance, puncture protection and durability. Don't recall getting a flat last year (about 6000km on road bike). The tyre I keep coming back to. I've tried many alternatives, but this is the only tyre that gives me total confidence descending at high speeds and still has relatively good puncture resistance and wear characteristics. Quality tyre, can't go wrong with these. Changed from gator skins and never looked back. Still good puncture protection but much better grip. A classic that never goes out of style. On my 3rd set for 3 different bicycles. I had a couple before. It's time to change the rear tire. I added one more on the order list. You can not give up those tires that have excellent grip and rolling resistance. Thanks Merlincycles. I have been using these for about four years and have been very happy with the ride quality and puncture resistance (haven't had a flat yet.). I also find they're very easy to get on and off my rims. However, my last GP4000SII on the rear only lasted 3400 km, about 1000 or so less than usual. I hope the replacement will give me a little longer service. Best tires ever! Wonderfully fast shipping and excellent service all the way to Texas! Thanks guys! I'm less than a week in using these Contis, having switched from the Vittoria Open Corsa Evo CX Folding Tire I ordered here 17 months ago. The 4000 S II in comparison to the Evo CX is notable, namely the Contis handle sharp turns better and has higher climbing capacity. My ride times have dropped by a few minutes. I ride in Oakland and San Francisco, CA mainly, meaning glass and construction debris are my tires' worse enemy. The thicker material works great in combating it. The increase in weight is hardly noticeable. Oh, and of course, Merlin has the best prices hands down. The go-to tire. Runs fast and surprisingly flat free for the last 2,000+ miles. Awesome tyres - great grip, low rolling resistance, and excellent durability - I got about 10,000 km on my last front tyre. Favorite road tires - good longevity - good grip - a bit of a challenge to mount on some rims - but good tires. The Best! Great handling, long wear and puncture resistance, lightweight, and and at an excellent price. What's not to like? Great tyre and very good puncture protection and grip. I do unsupported without carrying spares and can`t recall a problem. A 10 from me. Great tyres - you really can't go wrong with them. One nice point is that, when inflated, they are slightly narrower than other 25mm tyres I use (Vittoria Open Corsa and Schwable Pro One) which is great for one of my bikes that has limited frame clearance as there is no tyre rub. Great tires, anti-puncture system very effective. Great tyre, have used this model for many years. I never get flats, very strong. Bought these as have heard they are the gold standard. They are light and very well manufactured with obvious puncture resistance. Went with 23mm for an intermediate rim width and they come in big so did not feel need for 25mm and save some weight. Have had good experience of the plain grand prix so expect these will be an upgrade. Continental Grand Prix 4000 S II 700x25 is very comfortable, weight is not a problem (same level as other brands / models of tires), it has excellent protection against bores and requires few Watts to spin in comparing to other tires. These are my favorite all-around tires with low rolling resistance and good traction on wet roads. 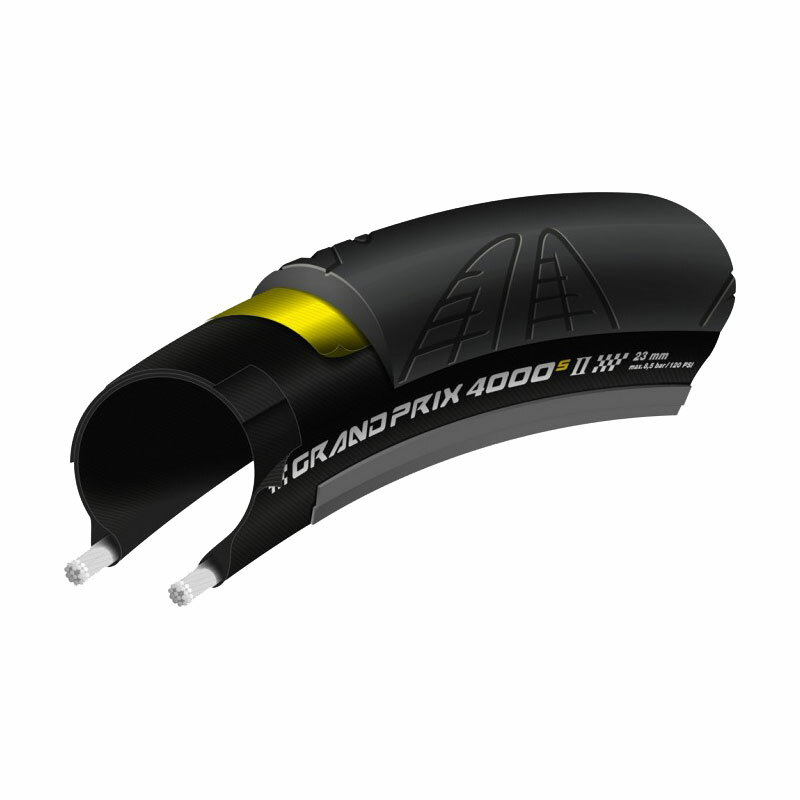 There are better puncture resistance tires but I have confidence with the GP 4000 for races or training. I love these tires and they are worth the price. I always use this tyre. And everytime it is good for me. Great wearability - I got about 3,000 miles on the last set., They are not as prone to punctures as other brands I have tried. Hold pretty good pressure with minimal loss. Tyres are great: my first pair of 700 x 25 and checked many reviews; after putting them on my bike, the same ride I have been doing for months; I increased my ave. time by 1 mph faster! My preferred racing and training tire - lower grade Masters, so I just want it to be quite quick and durable. The low rolling resistance is easily noticeable. My bike is much more responsive since I put these tyres on. They grip the tarmac very well. The rear tyre won`t skid that easy when braking anymore. But you should be very careful on wet conditions in the first rides. They won`t grip the wet surface at all. But they work ok after some 100km or so. 25c version is actually 27.5mm wide on a 17c rim. Simply the best tyre. Essential puncture protection for Uk roads. Softer than expected (23mm), but good combination with stiff Racing Zero. These are great all year round tyres. I have rarely suffered a puncture even when commuting country lanes through the winter. Great tyres. Low rolling resistance, and my current GP4000SII's have 4500km on them and still going strong - even on the rear. These were purchased as direct replacements of a previous pair I have done many, many miles on and been well pleased with. Got a 2,500 km tour next month so decided fresh rubber would be a good idea. Great tyre, fast, secure and very resistant to punctures. I cannot fault them, save for the price! This is a repeat order though, they are that good. Highly recommended. I have gone through a number of these tires over the years. For city riding, they are definitely my go-to tire. Great all round tyres, suitable for both training and racing. Excellent puncture resistance and really good grip in the dry and wet. Continental Grand Prix 4000 S II are my choice for road cycling tires because of where I ride. With a mix of both urban and country roads on a lot of my routes which I ride, I need a tire that provides both superior puncture protection, and low roll resistance . The Continental Grand Prix 4000 S II tires deliver both. I use GP4000's on all of my bikes. Very reliable and make for a confident ride. I normally use 23mm but have started using the 28mm on my commuter. Much more comfort with little or no difference to road resistance. I got three flats in a row before I changed to these. No more flats! My favourite all round tyre, great puncture protection, excellent grip and long life. Great tire - excellent grip in corners wet or dry, good puncture resistance and good supple feel. Awesome tires. Roll fast and smooth. Pretty fat for a 25. Excellent tyre and since I switched to these a few years ago, doubt I would buy anything else. They noticeably roll fast - have had to brake when following my friends on descents. My last pair lasted over a year, without many punctures. Only 4*, because it's really hard to find the rotation direction arrow. The only tyre I use and trust for racing AND winter training. Grippy, reliable and the best value from Merlin with next day delivery. Continental makes a great tire in the Prix 4000 S II. Seldom a flat and great feel for a clincher. Good happy medium--good road feel with good flat protection. Road feel isn't up there with Veloflex or Vittoria but it lasts a lot longer. Pretty solid choice for peace of mind! Very resistant to puncture! Just made 2000km with one puncture (a small glass got in a tiny hole made in some point during my rides). And it was so small that I could ride 30min to get home and fix. Originally bought a pair of these for my new Giant Defy last year having run a pair of the original GP4000s on my first road bike & instantly gained performance (rolling speed & grip) over the Giant tyres supplied. The addition of the Vectran breaker lets me relax going out on the longer rides that only a really extreme road issue is going to compromise the tyre. (In this case, the re-purchase is due to a screw which left a fairly large hole in the tyre). In 3 years of sportive & training rides, the screw incident is the one & only puncture suffered on these tyres. Highly recommended. I've used this tire for thousands of miles already, and bought this one to replace a worn-out rear tire. Couldn't be happier with its performance - very fast and smooth for racing, while still strong enough to prevent punctures. In ~5000 miles of using this tire on various road surfaces, I've only ever had 2 punctures, and both were pinch flats. Overall, an excellent tire, and I could not be happier. Fantastic tyre. Puncture resistant, good rolling at speed and hard wearing. A must for dry roads. Nice grippy tires. I can really lean the bike in the turns with more confidence. I have used Continentals for 15 years. Always a good tire in the 3000 series and now with the 4000S II. i have ridden in all kinds of weather and have never had tire problesm and flatting issues with any Continentals. I'll buy them forever!! Great all around performer. Reliable and durable. My favorite tyre for many years. Just the right blend of comfort and speed. Easy to get off/on. Best price on the planet. A noticeable improvement on the Schwalbe Luganos I was running. FIngers crossed, puncture protection seems good so far too. The only tire I have ever used on my road bike and I see more of these on other bikes on group rides than any other. Great tyres, used first for 100k sportive to 'run them in'. No problems, easy to fit on my new Shamal Ultra wheels without levers. Have used version 1 for many years and I hope these new SII's continue to be as good. Highly recommended. Hands down the best performance clincher on the market. Excellent all around performance. Superior rolling resistance, cornering grip and solid puncture protection combined with decent tread wear. The only downside is the harsher ride quality compared to other tires..but the trade off is worth it. Great tyre, excellent price. Tyre was easy to fit and the ride is really good. Will definitely buy again. Have had the GP4000 S before and have always been impressed with them. The delivery time from ordering on line to receiving the goods was impressive. I've run the GP4000s for last 12 months and have covered nearly 4000 fast and trouble free miles. If anything these seem to roll even quicker and whilst I've only covered 200 miles I'm hoping they are as reliable and robust as the originals. Been using Conti's since the GP3000 days. They are a perfect combination of fast, light, and durable. Great price for a great tyre, I use these all season from winter training to racing as the puncture protection is superb and they roll very well. Great tyres, would not change from these now! Favourite tyre, bought to replace worn out one. Great grip and puncture protection. 25mm is the only way to go with the state of the roads at the mo. Best price on net and and extra few quid off that with the Jan sale . A good grippy tyre in the dry and whilst you can't expect miracles in the middle of winter it does seem to grab hold of the road. The tires are as advertised. I have ridden the Continental 4000 for years and have now been riding the 4000s II. They seem to give me more miles before I have to replace them with no decrease in speed and puncture resistence. Why would you use any other tyre...Simply the best! Excellent tire! Good wear, low rolling resistance, and no flats (so far)! Great product. I couldn't believe they could've improved the GP4000s but they have. I weigh around 90kgs (on a good day just less!) Grips well and is very tough. Excellent tyre to use. Have had flats after 3,500 kms and that is the sign that you need a new one. Excellent tyres. I use them year round and they last a good 5000 miles on the rear. Fast, grip well and durable. Pretty puncture resistant as well. I've done 7 700 kms with my previous Continental 4000 s. These one seem even more effective than the 4000 s. I'm very happy with them. Truly recommend it! I changed to 25c tyres at the start of 2014 and am now converted. I run these at 120psi and they are no slower than 23c but more comfortable and with better grip. These GP4000S II's last well but I had a flint stone go straight through the rear in the wet recently. The tyre was ruined as it cut through the breaker belt. Hence buying this replacement. But that could happen with any tyre. These are certainly much more robust than my Schwalbe One's (which I also rate highly). I have ridden these tyres in the UK on bad roads and in the French Alps on fast descents and they feel great in all conditions. I highly recommend them. Great winter tyres. Super wet grip and plenty of compliance in the 25 size. Been using these tyres for 12 months now and the only puncture was a pinch flat caused by under inflation. Great punture resistence and they seem to last longer than Pro 4's. Although I'd have to say they don't roll as well as the Pro 4's. I was using Vittoria Rubino Pro Folding Clincher and they were wearing fast so I tried this. This is considerably more expensive and I obviously can't tell how it wears until some time has past, but the rolling resistance is no different to the old tyres, it's all in the mind. Conti GP 4000s 2's! Best clincher tires on the market imnsho! Such supple ride characteristics and very quick as well. Just completed a century ride and they most definitely made a positive difference in my comfort level. First time I have seen made in Europe (Germany) in a long time. I needed to replace only one tire, but when I saw the quality, I replaced both. Tire wear indicators are a great feature and will eliminate the guess work from estimating tread life. Overall, appear to be much better than comparably priced Michelins. Grippy supple and confidence inspiring. Excellent value and good quality. I have done about 400 miles on these tyres so far and love them. I will definitely be sticking with these in the future. Very good racing tyres, only ever buy these for the summer now. The only road tyre I now trust for general training. Hard wearing, grippy, fast - just the perfect balance. Tyres are good and grip road well. Particularly like the reflective edge around side of tyre wall. Ideal for that extra visability when turning out from a side junction in low light conditions. Went for the 25mm as less rolling resistance than 23mm. Happy with these tyres so far. Bought a pair of these to replace a set of 4000S's that had a couple thousand miles on them, and a torn sidewall on one. I'd forgotten how grippy these tires are when new! They provide a softer ride than the gatorskins I had on my backup wheels, and while I have no numbers to back this up, it feels easier to accelerate and maintain speed (lower rolling resistance?). Very easy to mount as well. Was a little worried that the model II would differ dramatically from the original 4000s's, but I think I'll love these just as much. Great tyres, quick and smooth rolling when up to speed. I've had Conti GP's for the last couple of years and have been really happy with their performance all year round and in all conditions. I usually get the 23mm wide tyres and run them at 110psi, feeling every bump in the road surface. I went for 25mm wide this time and what a difference!!! Even at 120psi everything is smoother and more comfortable but with the same confident levels of grip as before. Wow, what an improvement! Great grip in dry and wet. Loving these tyres. Arrived quickly too. Very grippy and looks great with the coloured side strip. Great performance and looks. High quality puncture protection as a bonus. Early days yet so hard to judge, but seem to roll well and give the impression of durability. Grip great so far, had no control issues wet or dry. Asthetically the green versions look great on my synapse as they are a good colour match for cannondale green.